Ornamental decorative patterns are hugely preferred by couples in all cultures to express their happiness over impending nuptials. These patterns may be used in real as a decorative pattern at wedding venue or they might be included in wedding trousseau. 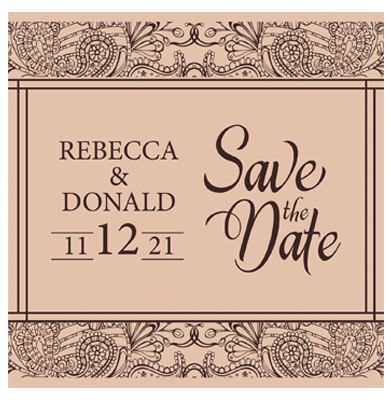 Custom 5x 5 inch ornamental seamless stripe decorative element save the date square corner magnets can be utilized by couples to express their joy over impending nuptials. Personalized 5x 45 inch ornamental seamless stripe decorative element save the date square magnet can leave the guests transfixed and it will highlight the excitement surrounding wedding.